You know how much you love them, but do they know? Well we're here to help you show them loud and clear without leaving any doubt in their mind just how loved they are. With Australia's finest selection of romantic Valentine's Day gift hampers, this is truly your best opportunity this year to shower them with love and luxury. The Hamper Emporium are the creators of Australia's best Valentine's Day hampers, backed by an exclusive range of romantic gift hampers, exclusive gourmet produce, and some of the finest wine and Champagne from Australia and the world, love is all around, and with just a few clicks, we'll help deliver love directly to their door, with FREE delivery! What Are Australia's Best Valentine’s Day Hampers For Him? Perhaps he's fussy, perhaps he's not, but we know for sure he'll be impressed either way with our range of outstanding Valentine’s Day hampers for men. If you need some inspiration, we'll suggest some of our favourite men's gift hampers below, which are bound to be appreciated by your recipient, and if you're lucky, he might even share some of his gourmet delights with you! Our Glenmorangie Whiskey Tasting Hamper from our hampers for men catalogue is an exquisite choice, featuring the finest Glenmorangie whiskey selection. This tasting pack takes him on a whiskey journey of smooth spirits and a journey of individual flavour, with each bottle bringing a new experience with each sip. The Glenmorangie gift hamper includes the Lasanta, Quinta Ruban, Original, and Nectar D’Or along with a carefully curated selection of treats he'll adore. Who says pampering and skincare is just for women! We know men love to look their best and feel amazing, which is why the L'Occitane & Shiraz men's gift hamper has become one of our best sellers. Pamper him with this specially formulated luxury skincare that's been created with men in mind. This luxury French skincare brand is loved the world over and he'll feel like he's drifted into a world of spa pampering with a plush robe and L'Occitane Cedrat Skincare. What Are The Best Valentine’s Day Hampers With Free Delivery? Here are some of our personal favourites for Valentine's Day 2019, all including Free Delivery right across Australia, so that you can deliver something special to your love, that offers gourmet luxury, with a choice for every budget. Our Moët Grand Vintage & Chocolates is the perfect Valentine's Day gift idea. Containing an exquisite bottle of 2008 Moët & Chandon Grand Vintage, there's a reason this Champagne is loved worldwide, and there's a reason it's worthy of sending your love this year - because it's an exquisite Champagne that will leave no doubt in their mind that Valentine's is a true celebration of your love together and your love together is worthy of the finest of gifts. When it comes to finding a truly unique and romantic gift, you can't go past a personalised gift hamper. This special range of hampers includes our personalised leather accessories so the love of your life receives a gift that really is customised just for them. The Personalised L'Occitane Hamper not only included a beautiful range of French skincare from world-renowned skincare brand L'Occitane, it also includes a beautiful selection of sweets and nibbles to tempt her taste buds and a beautiful plush robe to help her kick back, relax and enjoy being showered with love. What Are Some Popular Valentine’s Day Hampers for Her? Our online gift store is packed with Valentine’s Day hampers for her. 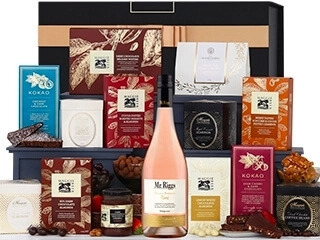 Treating the woman you love to a gift that's truly special just gets easier, as our romantic hamper range continues to grow, and our partnerships with some of the world's most luxurious brands continue to strengthen, say I Love You in style with Australia's most luxurious range of Valentine's Hampers for 2019. Beautifully presented inside the L’Occitane Pamper Hamper, she'll find an exquisite collection of cosmetics, chocolates, and sweet nibbles. 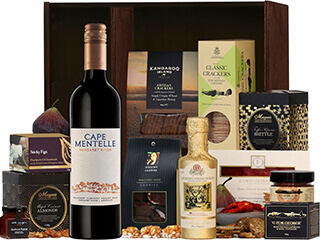 This elegant hamper also contains a variety of sweet pantry items, so whether she lives in Sydney, Melbourne, Brisbane or Perth, or any corner of the country, we can deliver this exquisite pamper hamper directly to her door with free delivery and a guaranteed smile on her face. Our Sweet Epicure Hamper provides female Valentine's recipients with the ultimate collection of sweet nibbles and chocolates this Valentine’s Day. It includes brands such as Butlers Irish Chocolates, Ernest Hillier, the Woods Farm, and Morgan’s, so plenty to enjoy for your recipient! Don't gift her boring flowers this year, it's time to pamper her with something truly special and Australia's most luxurious gift hampers are the perfect choice. What Are the Best Valentine’s Day Hampers in Australia For 2019? Curious about the best Valentine’s Day hampers this year? It's true that every year we create an amazing range of new gift hampers, and every year some stand out as clear best sellers! Check out our overview below to find out! Our Moet with Australian Chocolates & Nuts is always a popular choice for Valentine’s Day, and it is not difficult to see why. The hamper comes with free delivery, is affordable, and includes one of the finest champagnes in the world. 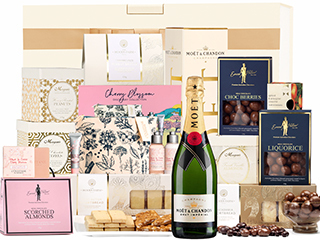 As the name of the Moet with Australian Chocolates & Nuts already indicates, this hamper contains a genuine Moet & Chandon Brut Imperial Champagne. The velvety champagne is beautifully complemented with sweet nibbles from Morgan’s. So, plenty to enjoy together on Valentine’s Day. Another popular hamper for Valentine’s Day is the Luxury Hennessy Hamper, a gift hamper that is the perfect choice for him. Inside this hamper, customers can find a genuine Hennessy cognac, which is still considered as the best cognac in the world. 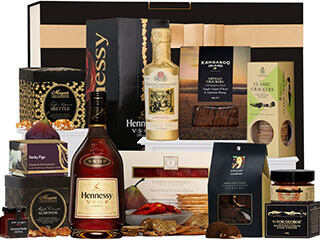 Naturally, the Luxury Hennessy Hamper is packed with gourmet treats too. 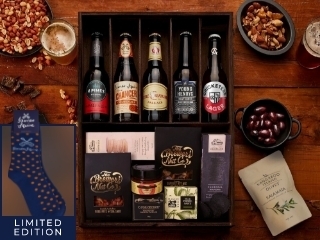 Inside the hamper, you can find nibbles from brands such as Baylies Epicurean Delights, but also the Brewer’s Nut Company, Gourmet Regional, and Kangaroo Island. Want More Information On Valentine’s Day Hampers at the Hamper Emporium? Do you need to find more Valentine’s Day hampers this year? Check out some of our new Valentine’s Day hampers in the Valentine’s Day collection! 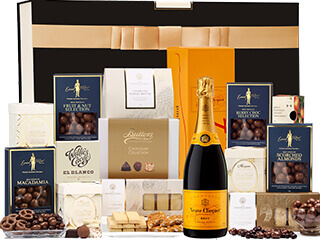 In this collection, you can find hampers that include wine, champagnes, whiskey, chocolates, and countless other products the couple can enjoy for Valentine’s Day. Have a question about one of our Valentine’s Day hampers? For more information about our hampers and the products inside? Be sure to contact the Hamper Emporium for some assistance.